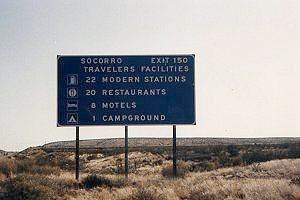 This sign on the interstate welcomed travelers to Socorro. 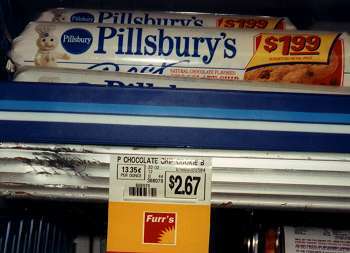 Note the discrepancy between the price printed on the package and the price charged by Furr's--a 33% markup. Socorro is the seat of a county the size of Connecticut, and in 1989 had a population then of 12,000. It also had two supermarkets: Super Mart and Furrs. Super Mart was the rural hometown store that catered more to the folks who drove for an hour to come to town. At Super Mart, you could get 25-pound tubs of lard; Furrs' largest size was 10 pounds. The first time I went to Super Mart, I received quite a shock as I walked into the meat department. There, wrapped in plastic and sitting on individual styrofoam trays were four pig heads with their snouts pointing up in the air. I felt like I had wandered into the prop room for Lord of the Flies. In contrast Furrs was considerably more urbane--the most exciting product I ever found in its meat department was tripe. Every time you went to the checkout counter, through, you experienced "Furrs roulette"--the prices on the shelf often were sharply higher or lower than the price the scanner would divine. Furrs routinely charged even higher prices than the "suggested retail" prices printed on many products like cookie dough. To maintain its sophisticated character, Furrs sometimes explored new products, many of which were poor sellers, such as the shipments they received of squid and Horchata, a non-dairy rice beverage apparently of upscale Hispanic origin. Horchata was available in the dairy section in half-gallon Sunny Delight shaped jugs, in a variety of flavors: Banana, Strawberry, Vanilla-Tapioca, Orange, and Chocolate-Cinnamon. But it didn't seem to be selling well--after one initial shipment had lingered on their shelves for some length of time, they discounted it for quick sale. Schlake, in a tunnel under Workman Center. One of the great academic strengths of New Mexico Tech is that it is in the middle of the desert. The nearest shopping mall and first-run movie theatre, for instance, is 80 miles away in Albuquerque. Compared to schools located on a beach or in a large city, Socorro offered very few distractions. Under normal circumstances, college students would occupy much of their time through the acquisition of and subsequent involvement with main squeezes. However, the male-female ratio at Tech presented a problem. For every woman in the school, there were three men. A fellow student who called himself Schlake developed a theory explaining why the situation seemed even more dire (and, in consequence, helped explain why he personally remained squeezeless, although he also explained that "Schlake" translates from German as "scum"). If one presumes that three-quarters of the potential maximum number of male-female couples have formed at any given time, this removes 75% of the women from circulation, but only 25% of the men. Therefore the effective ratio is nine single men for every single woman. (In addition, to the extent that gay women outnumbered the number of gay men divided by three, the ratio would be further worsened. Schlake alleged that absolute number of lesbians outnumbered gay men, which would further worsen the ratio, but he could produce only unauthoritative anecdotal evidence for his hypothesis.) This 9:1 ratio produced a great many effects of interest to sociologists, but of little direct involvement to Horchata. However, it also left a large pool of single college men desperate for entertainment in the middle of the desert. Schemes and ideas that would have gone neglected at more gender-balanced institutions of higher learning were pursued with great vigor at New Mexico Tech. Jethro, on the third-floor balcony of South Hall showcasing a "Drinks" cup from the campus cafeteria. 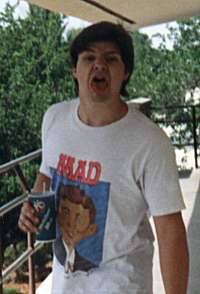 One especially boisterous single man I knew had been named Brett Palmer by his parents, but introduced himself as "Jethro". He selected this nomenclature to resemble Jethro Tull, but many on campus presumed his namesake was Jethro Bodine from the Beverly Hillbillies. Jethro and I had developed the habit of proposing lose-lose wagers on a frequent and routine basis. "I'll bet you a quarter you can't catch that cat down the street." "I'll give you five cents if you climb Box Canyon with your nose." As we entered Furrs one evening, neither of us had ever taken up the other on any of these bets. As we walked past the dairy section, we began our routine derision of the Horchata and the increasingly desperate attempts to sell it. Jethro pointed out that the jug of Orange Horchata had white chunks floating in it that were particularly unappetizing. "I'll buy you a jug," I said to Jethro, "if you'll drink it." He looked at me for a moment without sufficient scorn, so I added "...all at once." His expression still lacked scorn, so I recalled the rapid beverage consumption contests I had participated in at St. Anselm's Abbey School and proposed some refining details. "You'll have two minutes, and if you don't drink the whole thing, you have to pay for it." For some reason, he took me up on it, though he savvily negotiated the time allotment up to two and a quarter minutes, and he insisted he be allowed to select the flavor. He chose Chocolate-Cinnamon. He would later say that "The chocolate was fine, but the cinnamon had an awful abrasive bite." From my perspective, it seemed like I had established a win-win situation. If Brett drank the Horchata, I expected the entertainment value of seeing Jethro consume it would be worth $2.19 (plus 5 13/16% Socorro County sales tax). And I reckoned that I had good odds that he'd fail to drink the entire quantity, and I'd have spent nothing. Either I would get to keep my money, or Jethro would get to keep the Horchata. In reality, however, neither would be the case. Every Wednesday, Jethro and several regulars hosted a weekly movie viewing, in light of 99¢ movie rentals that night of the week at the local video outlet. One one such night following the movie, we all gathered full circle around Jethro in his room, ready to observe what took place. He had prepared himself beforehand by abstaining from food and drink. He then prepared the jug by shaking it vigorously, to minimize the risk of encountering chunks. I was the official timekeeper, and gave him the further allowance of telling him I would start the timer as soon as he began to drink the Horchata. As we all looked on, expectant, he raised the jug to his lips, and began drinking. I started the timer. The first half of the jug went well, and ahead of schedule. Jethro apparently had some experience chugging beverages, and I began to suspect that my $2.19 plus tax might have been spent for only the most meager of entertainment. But, at about the one-minute mark, he came up for air, and his face demonstrated that he would be unable to maintain his pace. He asked how much time remained, and held up the jug to inspect how much remained. He steeled himself for completion of the dreadful task, and raised the jug again. Pausing once more at 1:40, he showed signs of further weakness, but only one cup or so remained. "How much time?" He waited until 15 seconds remained, then raised the jug one last time and downed the remaining Horchata, slamming the empty jug back on his desk 2 minutes, 9 seconds after he had started. He stood up in triumphant celebration of his victory. But, a moment later, his face betrayed significant gastric distress, and the circle around him was hastily parted to clear a path for him toward the bathroom, three meters distant. I happened to be close to the bathroom, and heard what happened. It is important at this point to understand certain aspects of the human digestive system. From outside the person doing the digesting, stomachs seem like quiet, simple places. Inside the stomach, however, it's an entirely different story. The stomach wall consists of extremely strong muscles. In routine digestion, different portions of muscle work against each other, kneading the stomach contents like two well-matched teams in a tug of war. Through this choreographed interaction, the stomach muscles can transform even gnarly matter such as cheap steak into pulp. But there is another mode in which the stomach muscles can operate. Once in a while, a digestive system discovers that it has consumed something in error, and normal vomiting occurs. In rarer circumstances, which most people have not experienced even once, the digestive system discovers that it has consumed something so profoundly distressing that the only course of action is an immediate reflexive expulsion. At these unusual times, all of the muscles work in concert. If two teams in a tug of war suddenly stop working against each other, and all pull in the same direction, they can extract cars from the deepest mud with one great heave. And so it is when all the muscles of the stomach simultaneously contract in one great powerful seizure. The result is projectile vomiting. Furthermore, it would also help to be familiar with some of the basics of hydrodynamics as applied in toilet design. If you pour liquid into a toilet bowl slowly, some will slowly and invisibly flow out the back, and the toilet will not flush. Flushing requires the rapid deposition of a large quantity of liquid, which like a siphon causes everything in the bowl to go along for the ride and flow out the back in a great rush. As we all waited outside the small bathroom, we heard Jethro give a loud primal bellow as his gut rid itself of the Chocolate Cinnamon flavored rice beverage. The solid brown stream resembled that from a fire hose. Fifteen seconds later, with his gut freshly emptied, Jethro stumbled back out of the bathroom. We all applauded his performance, well worth my $2.19 plus tax, and he uttered the memorable line "I didn't even have to flush." Another colorful Tech student was Tim. 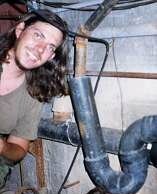 Tim was a physics major as well, and is by far the most frugal person I have ever met. He took brief cold showers year-round because he did not wish to pay to heat the water; many times he bathed in the school gym; other times he enjoyed the luxury of a cold shower at home and then washed his clothes in the shower water by treading upon it as one would stomp grapes. He refused to pay for any luxuries whatsoever. His waterbed was unheated--he warded off hypothermia by placing a thin mattress atop the waterbed. His refrigerator was not plugged in. Socorro had only one television station (a repeater of an Albuquerque station), but he considered cable an extravagance. So he salvaged a pathetic specimen of an aerial antenna from a neighbor's trash, and pointed it toward the cable transmission line outside. This provided him with a picture that, with great care and attention, could barely be distinguished from pure noise. For reasons I never identified, he wore blue rubber bands in his hair; some presumed he had found the most economical hair management solution. He also almost always wore black leather pants (one of his few luxuries) and a jacket even on the hottest days--he commuted on a motorcycle, but some presumed it must be to retain the odor from his water-conserving bathing habits. The one time I visited his house, his living room contained such a pungent odor that I was unable to maintain my presence without nausea, and I departed immediately. It may have had something to do with the lack of garbage collection that had resulted in a large pile accumulating in his kitchen corner, with its roaches confined with a line of borax powder on the floor. When Tim first set foot on the Tech campus, he was a gigantic man--well over 300 pounds. One summer, though, Jethro reported that he went with Tim to an oriental grocery, and Tim's eyes gleamed when he reached the back where the 50-pound sacks of rice lay as if in a United Nations refugee depot. He purchased one sack, and for the rest of the summer lived primarily off one bowl of rice--and four hours of intensive basketball--per day. He lost over 100 pounds, but even when he was down to a svelte 189 pounds he still retained his peculiar eating habits. Jethro brought Tim to an all-you-can-eat buffet in Socorro, at which he ate a Herculean portion and then fasted for 30 hours. Such was the nature of Tim. Within a day or two of Jethro's Horchata episode, he contacted us to see if a similar offer might be again made. The Council and I formed a consortium to make a wager against Tim's stomach. The deal was this: Tim would have five minutes to consume two half-gallons of Horchata, in flavors of our choosing. If he succeeded--and kept it down--we'd pay him $5. If he failed to drink it in the time allotted--or if he didn't keep it down--he would pay us $5. In any case, we paid for the Horchata. From our perspective, we had a win-win situation--we'd receive easily $1 worth of entertainment per person in watching Tim consume an entire gallon of Horchata, or we'd get a cash rebate that lowered the price to less than 30 cents in exchange for watching him try. Tim also had a win-win situation--he saw an opportunity to get lots of free food and, better yet, get paid for eating it. Two weeks after Jethro's Horchata performance, we again gathered in Jethro's dorm room for another spectacle. This time, Jethro was among the circle, sitting on his desk next to his warehouse-sized case of King Dons. Tim was at the center, and I was timing again. Tim selected the Banana jug of Horchata for first, because he liked it least and figured the second jug would wash away the flavor. He shook the jug, raised it to his lips, and I started the timer. It didn't stand a chance. A minute later, he switched to the chunky Orange flavor. (The floaty bits held considerable appeal to the flavor selection committee.) He took his time with that jug, savoring it for nearly three more minutes. But he never showed any alarm or distress, and it frankly seemed as if he might regularly consume a gallon of beverage. But as he returned the second half-gallon jug to the countertop, he made it clear that he wasn't fond of the Orange flavor. "Jethro, can I have a King Don? I need something to get this flavor out of my mouth." Thus I "lost" two bets, but found the entertainment a good investment.